Want to Learn More About LXI and How it Works? This book provides a practical overview of the LXI standard; it explains how users can first communicate with LXI devices as well as describing the technical aspects of the standard. 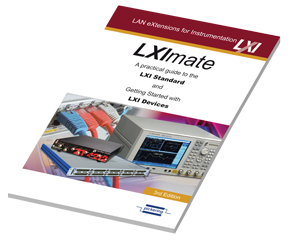 The LXImate is intended for those just starting to design LXI products and those who want to use LXI products. Published by Pickering Interfaces, this is a living document that we will continue to develop in support of the LXI standard and its future evolution. We welcome any feedback from users on subjects they would like to be included in future issues.